A record attendance for an ICFM Annual National Members’ Conference is anticipated for the 2018 event with more than 200 members and their guests already registered. And with two weeks to go until the Conference, which will also celebrate 25 years of the ICFM and look to its future, the expert speaker line-up has been finalised with Jaguar Land Rover as host sponsor and Chargemaster, the UK’s largest provider of electric vehicle charging points, becoming the headline sponsor. Support sponsors are: Accident Exchange, CD Auction Group, Geotab, Jaama and Selsia Vehicle Networks. The focus of this year’s Conference is the fuels that will power tomorrow’s company cars and vans and the emissions dilemma facing fleets amid national concerns of air quality. The Conference, entitled ‘Fuel for the Future, the Emissions Dilemma’ will be held on Tuesday, March 20, at The British Motor Museum, Banbury Road, Gaydon, Warwickshire, CV35 0BJ – the home of the world’s largest collection of historic British cars. Experts from across the fleet industry will focus on providing advice and information aimed at helping fleet decision-makers make the right strategic powertrain decisions for their future company car and van operations. • Tony Greenidge, business development director, IAM RoadSmart. They will cover a wide range of topics impacting on fleet fuels and emissions including: vehicle procurement, blended fleet vehicle deployment, residual values, the impact of fuel choice and emissions on occupational road risk and vehicle choice and the driving skills required to take to the road in the new generation of models. The celebrity guest speaker at the 2018 ICFM Annual National Members’ Conference will be Gavin Hastings, a former captain of Scotland’s rugby union team who was capped 61 times. 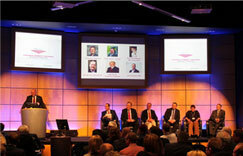 ICFM was founded in 1992 with the first Annual National Members’ Conference held in 1993. However, far from looking back over 25 years, the Conference will look to the future. ICFM is dedicated to advancing the profession of car and light commercial fleet management through a range of externally endorsed qualifications. 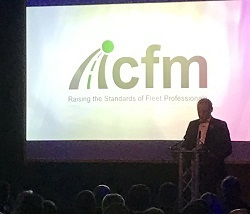 The Conference will also include the presentation of awards to fleet decision-makers that have successfully completed ICFM training courses since the last event. ICFM qualifications are viewed as the de facto stamp of approval for employees with fleet responsibility whether as full-time professional fleet managers or as part of an HR, finance or procurement role. ICFM director Peter Eldridge, who has been involved with the organisation since its inception, said: “Advance delegate registrations mean that the 2018 Annual National Members’ Conference will set an attendance record for an ICFM Conference. “That, we believe, underlines the importance that the membership attaches to the role of the ICFM in enhancing their skills and fleet management knowledge and the fact that fleet decision-makers are facing more changes today than in the past 25 years. Last week ICFM revealed that it had received a record 51 applications from employees with fleet responsibility to join its training programmes in the first two months of 2018. Those challenges include: Increasing vehicle taxation, the arrival of the Worldwide harmonised Light vehicles Test Procedure, the introduction of Clean Air Zones in towns and cities nationwide, ‘Big data’ and all that it entails – the connected car, the internet of things, cyber security concerns, the May 25, 2018 introduction of the General Data Protection Regulation, the January 1, 2019 introduction of new international lease accounting standards, which requires major organisations to report leased assets on company balance sheets, the rise of Mobility-as-a-Service and the move to a total cost of mobility concept, and the as yet unknown impact of Brexit. The Conference will commence at 9.30am (registration from 8.30am) and finish at 3.45pm. Prior to the Conference, during the lunch break and at the conclusion of the event, IAM RoadSmart will be holding a ‘parking challenge’.